Thanks heaps Kai, I appreciate it, the rendering's working fine now! I had started over again with the dialogue attempt but I've got an assignment to finish up atm, do you mind if I catch back up with you again in a few days and send you the scripts if I'm still stuck by then? Thanks Kai, I've definitely been studying your example scene since I purchased STM and have been trying to get it set up the same way. At the moment I can get a basic single string to pass from one script into the STMDialogueSample provided as a test, but when trying to pass through anything from the saved dialogue that would shows up in Unity UI normally, instead it just empties the dialogue box and sits blank if I do it by STM. Also the typed in default text in the inspector is displaying to the camera as black and pixellated, no matter what colour is picked for it or if the default rainbow tag is on it. The SuperTextMesh component has the same material and shader, and is all set up identically to the provided example but I can't get it to have any effect at all. Any idea what could be causing this? I've spent the last four days trying to get a dialogue system hooked up to STM, first trying with Yarn and YarnSpinner, then with this system here, but I just can't get it to run. Using Yarn I replaced everywhere it expected to use Unity's UI text with STM's text, and I eventually got every error it threw at me corrected but then it just wouldn't actually display any text during runtime and I couldn't figure out what was missing. With the second system I feel like I'm close to getting it but as soon as I integrate STM its giving me a "CS0120: An object reference is required to access non-static member" that I just can't crack or understand what any solutions I've googled mean. I've gone back and forth right through the provided documentation without any luck. Tbh I'm really struggling to understand the difference between the Rebuild, Complete and Undrawn functions? Is it at all possible to use STM with a dialogue system? Could you tell me what I'm missing? Oh wow this is wonderful. Beautifully written! This is cute! Keep going, I'm interested to see more development on this! Awesome job, and great writing! I'd never heard of forum theatre before, what a neat idea for a game! Really enjoyed this, was very intense! Great atmosphere of dread and hopelessness, which felt all too familiar. :O Wonderful job! Animation for cormorant done for now I suppose, it has some clipping issues but there wasn't much sense spending any more time on it at this point. I was trying to animate at the appropriate size and angle on screen for what it'd be looking like in-engine, but zooming in to it at a closer range with any camera wider than a 50mm (such as the gif below) it looks odd and I was worried that it'd look much too goofy in the game to work okay and would be better off dropping it having any animation at all with the limited timeframe left. But in the end, at the correct small scale in the game, I was pleased to see that it doesn't work too badly for a rushed one for a jam (I hope so anyway). I know I need to have better trust in things working out according to their initial design and purpose, especially when working in 3D with a time limit where it is so easy to just spin the thing around to some ridiculous angle it will never be seen at anyway and think oh god this doesn't work at all. I think it's a confidence that will come over time, the more times I go through the process (especially when being able to experiment and see a range of results). Got the fish integrated okay, spawning random types of them at different locations in the level. At this point was tossing up whether it'd be worthwhile to have ambient ones that were differently coloured/lit that the player couldn't pick up. I left it with the one type and then decided that surfacing after the first dive should spawn multiple fish so the player doesn't have to spend quiiiite as much much time hunting them down one at a time (I still need to learn rearrangement of arrays to better solve this issue). There's of course issues with the current solution, especially the fact that catching new fish overwrites the old which leads to frustration for the player if they already have the next fish they want to surface with. 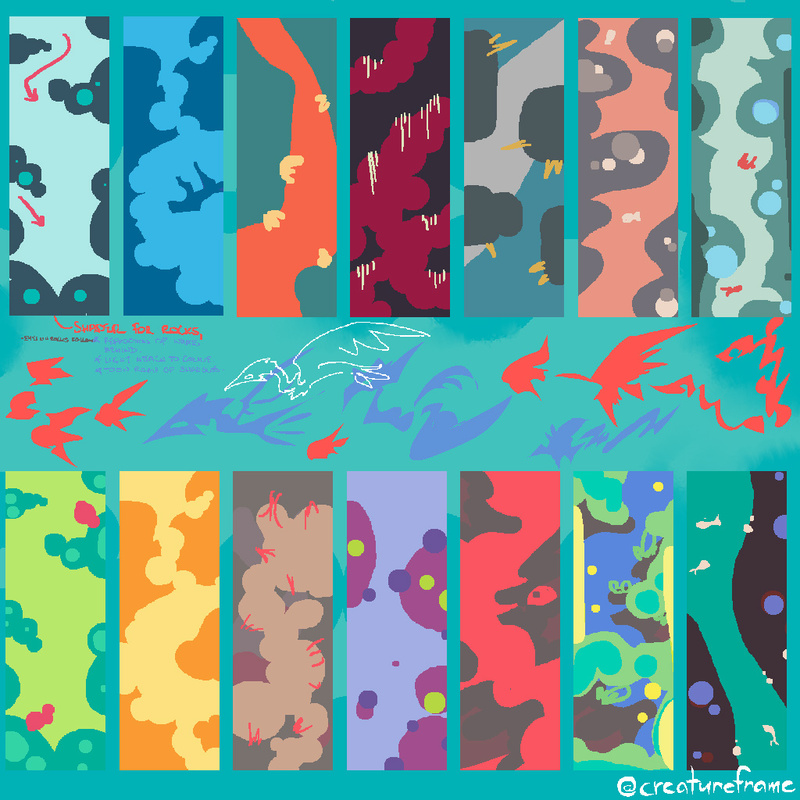 If I ever found time to go back and work on this game more, that would be the first thing to focus on fixing, as well as redesigning the air pockets and how they work as they definitely need to be more visible (thank you Studio Tectorum for the feedback, it's been super helpful!). They're finally set up to change speed at random (and animations matching speed) as well, which I tried figuring out for each type of fish (wasn't real smart making completely different bodytypes and separate rigs for the fish instead of just using different textures on the one :P), which really would benefit from a lot more tweaking. I'm so glad to have participated in Fishing Jam, it really was a ton of fun and I'm stoked to have been able to meet so many lovely people over the course of the week! I'm still going through playing all the entries, but everyone's done such a stellar job and should be so proud of the great works they've made! Thank you everyone for making this such a fun and inspiring week and thank you very much to Sophie for organising the awesome event! Fishing Jam 2 community · Posted in Grandmother is an Ama! Oh wow, this is an awesome idea for a game! And its great you've been able to get started on the playtesting already. How long does a session of it usually last? Didn't have much time on this again today, so just squeezed in some animations for the fish. 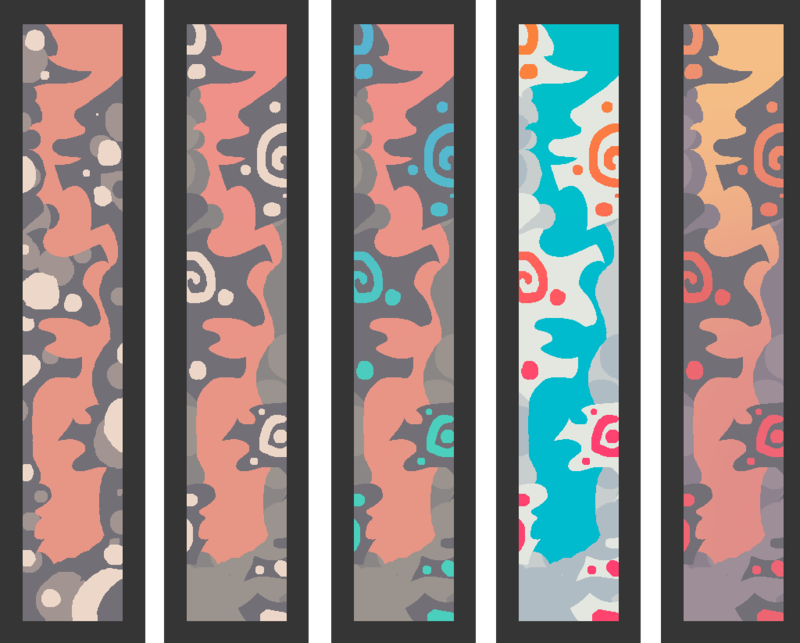 Wish I had more time to spend on them atm and fix them up, if there's any time left towards the end of the jam I would dearly love to be able to redo them all. Am yet to see how they hold up in-engine but I'm anticipating it'll give me a whole lot more things to note on what else needs to be corrected in the animations (especially for the moorish idol based one once attached to a moving gameobject), even at the small scale they'll be shown. Gah that sounds awesome, thank you so much for the rundown, you've got me excited to try it now! And geez you've done so much with it over that time. :O I really have to get onto trying out all your other games, they look awesome! Late post, whoops! Only had couple of hours to get some progress done, but I did get some feedback from a friend that maybe I should be pushing further outside my comfort zone and doing more scripting, tackling something like gameplay in a 3D space such as having the cormorant actually flying/swimming in the worldspace to catch the fish. While fun to experiment and try puzzling out something new, I think it'd be best at this point to return to the original setup, rescope the idea, and get focus on getting it finished even if it's a tiny and simple 20-second long game, since I'm not at all sure how much time I'm going to have free over the remaining days. Fishing Jam 2 community · Replied to Studio Tectorum in Have no name yet, but here's a progress thread! Thank you, you're too kind! :) I'm a slow writer but will do my best to try to keep up to date with it! Fishing Jam 2 community · Replied to OkrimGames in Have no name yet, but here's a progress thread! Oh my god, sheriff cormorant. :D I wish I'd made the whole thing themed that way now, that'd be way cute! I totally understand, it can be real hard to not feel frustrated. D: Good luck with the weeds today, what sort of way were you thinking they would move? Shout out if you'd like a hand with anything at all! Your new additions are looking great btw, I love the implementation of the jellies and zombies, what a great idea! 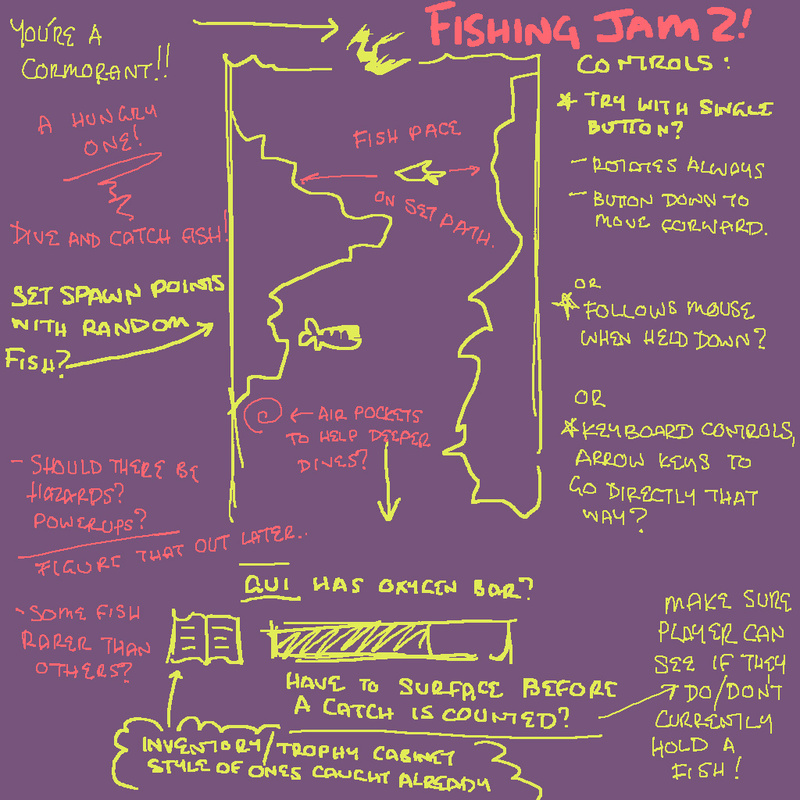 Fishing Jam 2 community · Replied to RhythmLynx in Have no name yet, but here's a progress thread! Thank you so much, that means a lot! :) Will try and stay updated with posts! Thank you! I was dawdling pretty slowly with it, but I don't think it would've taken more than a couple hours on the sculpt and around one on the retopo? In retrospect, one mistake I made was in not drawing up a plan of the topology flow and the rig in advance. While not completely necessary, it generally does help me a lot with solving upcoming issues as early as possible and saves more time during production. 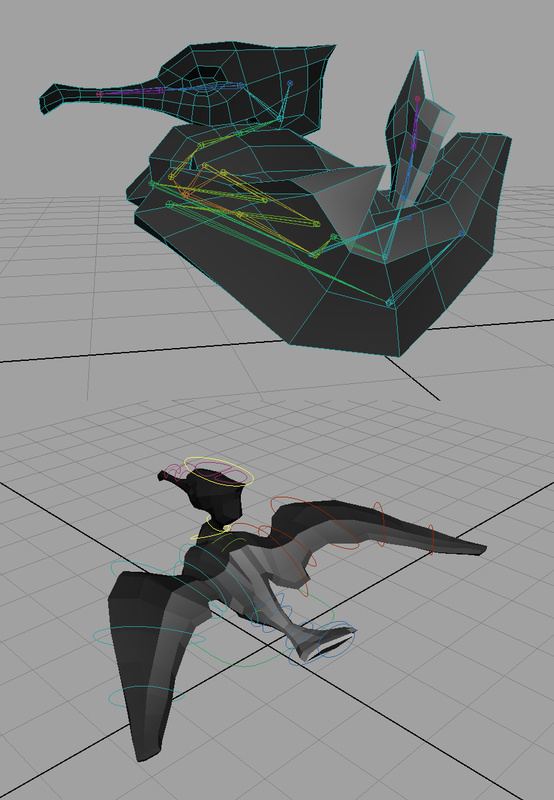 Just looking at starting on the cormorant's animation I could see where I'd already made things harder for myself, but at this point am just going to keep pushing forward with it. Figured it'd help to hold off doing the animation until after I get the controller sorted, considering how much reworking it'd save by knowing exactly what's required in advance. So schedule's been shifted around to mostly focusing on scripting and getting the major functions of the game working (even though it will be a very simple game) before going as heavy into the assetmaking again. During scripting was still able to get some work done on assets here and there. Jumping back and forward between the scripting work and the asset making today has helped alleviate tiredness. I'm still feeling worn out from the semester, so being able to put one thing aside whenever the ol' head gets too cloudy to think straight and move onto something fresh is working great atm. Gotten a start on the GUI for both the fish "checklist" and for the healthbar thing that will show how much oxygen the cormorant has during a dive, but if I get time towards the end of the jam I'd like to redo them all when the build is closer to being done. 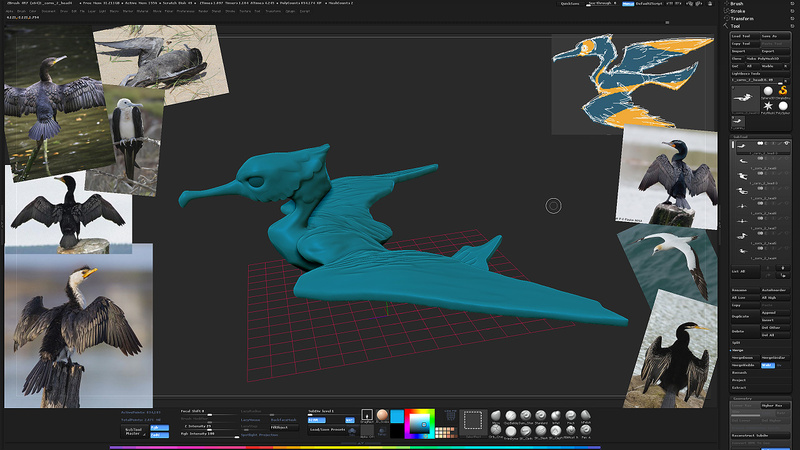 Modelling the fish was way faster than the cormorant as I skipped out on the sculpt/retopo steps, and they're overall going to be a whole lot simpler in every aspect. 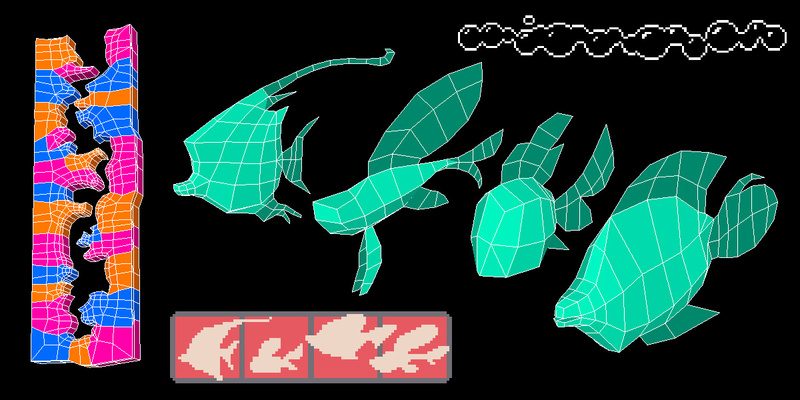 UVs and rigs are done on the fish now too, I can implement them into the build now I think and can do up their animations and textures later on in the week. So for the one-button controls I had wanted to test out something where the player would be always rotating and holding any key down would project them forward, while key up would switch rotation direction to allow for faster zigzagging in the desired general direction. Initially I had the cormorant spinning around as its idle (and was dreading having to animate an appropriate idle for that, given the time limit) but later today set it up so it just has a UI element spinning to show which direction it will move forward in next which is also a lot clearer to see. Also tried out making a second controller with two buttons, to rotate left and right (which is also set up to the scroll wheel which feels oddly fun to play around with) with the player is always moving forward just to see if it works better. Unfortunately its really unwieldy to control in such a cramped level space, so am going to see if I can make the first controller work (and if not start thinking of other possible directions to go in for controls - not limited to button count). Thankfully scripting for it didn't take long because it's near identical to one I had to build a couple months ago, so that's done with for now. Of course is going to need playtesting once the fish spawning is in to figure out how long the breath should last. Also am going to need to sort out the spacing between air pockets inside of the caves. For the camera, I'm tossing up whether to keep it so it simply follows the player around, or whether to set up one that lerps from position to position whenever the player moves off screen on a "new" screen. Now I'm thinking keeping the following one will work best, as the player is quite large on screen and moves through the space quickly enough (at this stage, still might adjust speeds) that having the camera constantly having to zip from spot to spot and starting and stopping so much could be nauseating for players. I think I'll wait for another day or so to texture everything since the palettes already getting away and it'd probably be a better idea to do it all in one go for better consistency. For now, the next step once I wake up is to do the controller / fish spawning / fish checklist scripting. Woah this looks fantastic, your controller looks beautifully intuitive and it looks like its going to be so relaxing to play! Yo it's coming along fabulously! The upgrade systems would be awesome to see implemented, and I really like the idea of dual managing the two sets of upgrades. Try not to stress about feeling like you've lost time on things, I always end up scrapping so much work when there's a deadline for something and feeling like it was wasted time, but in retrospect always see how much is learnt from it! And I agree with RhythmLynx about the immediate casting back into the water, it looks great and is going to help hammer home the sense of urgency to the player. Oh this is looking stellar! The ideas you've got for the different impacts of various catches sound awesome and are going to be great for extending the already neat idea for the base gameplay. I'm really keen to play this one! This is in pico8? :O That awesome, I've been wanting to try it out but it seems so complex its a little confronting! :V How long have you been working with it? Been knocked out asleep most of the day, so going to hurry and try and bang out the rest of the player asset tonight, as I'd like to spend my spare time tomorrow entirely on trying to get all the fish done. Before crashing I did manage to get most of the quick and dirty retopology and UVs done. Going to go straight into rigging now, I think will be easier to get the models and animations done for everything first and then texturing later if there's time (and ideally be able to fit everythings textures on the one map), just to make sure it all fits together and against the background too. Rig and skin finished, can't afford any longer on it for today so here's hoping it holds up okay enough for the range of motion I'm anticipating. :D This and the animating will be a real interesting challenge for me as I've never done wings before and doing this jam will be great for throwing me in the deep end on this and learning what unique issues rigging wings can throw up, stuff that will be really helpful for anticipating in future projects that may require something similar! Ohhh man that's a really really cute idea! Your art's coming along splendidly so far and it sounds like you've got a real clear idea on how you're going to bring it all together. I hope you can post more updates if you can, would love to see more! Has been nice and relaxing to do some sculpting work after so long, but unfortunately am going to have to get a wiggle on with retopologizing now that it's the end of day 1 (in this timezone). I didn't really get past just laying out most base forms and making sure it holds an okay enough silhouette at a small scale. Fishing Jam 2 community · Replied to Professeur Poire in Have no name yet, but here's a progress thread! Thank you, I appreciate it! Your idea for your submission sounds rad as, I wish you all the best with it! Fishing Jam 2 community · Replied to gogoprog in Have no name yet, but here's a progress thread! Thank you very much, I hope you have an awesome time jamming too! Hbu, how are you enjoying the jam so far? Reckon you'll be posting up progress? Okay decided I'm not going to bother with any pectoral fins on the fish unless they contribute significantly to silhouette. Got some final scribbles squeezed in, combining some aspects of different previous thumbnails, just so I roughly know what needs to be made. This is the last of concept stuff, am going to stop using this to procrastinate and move onto asset making now, promise. Dude this is looking great so far! Fishing Jam 2 community · Created a new topic Have no name yet, but here's a progress thread! Oh my god I've been so excited for Fishing Jam! I'll try and keep progress updated on here, I find that reflecting on the regular helps heaps with figuring out what to do next, and I'm looking forward to reading everyone else's progress threads! My semester just ended today so I'm looking forward to a chill week making this, am going to be aiming to keep my submission more art heavy with really minimalist controls (maybe restricting it to one button only if possible). Anyway, I wish everyone a super fun and chill jam, I can't wait to see all your games! I'm going to be using Unity for my entry and am also anticipating using Maya, Photoshop, and perhaps ZBrush and xNormal if time allows, over the course of this jam. Am starting from scratch today but will be basing off of what I learned during a couple of my prototypes built over the semester, ideas I wanted to explore and expand upon more. I've dedicated today's jamming time to planning out roughly what I want to make, estimating how much I'll need to get done day to day, and trying to bang out some concepts. 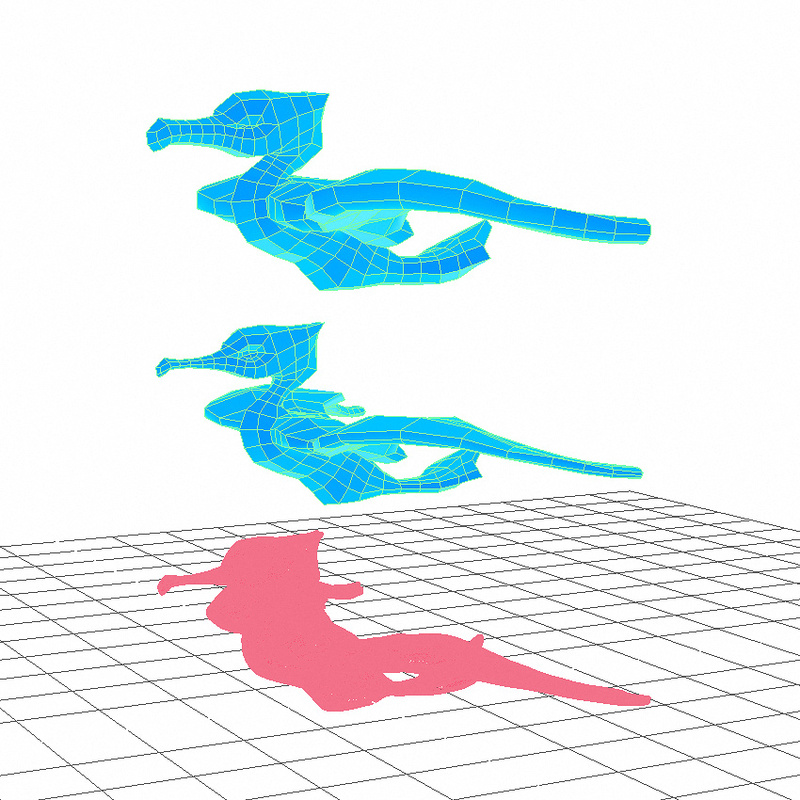 I want to make a thing where the player is a cormorant diving under the ocean for fish, but still have a lot of figuring out to do with the details. I always try to write up some sort of mini GDD before starting anything ever, otherwise I'll be horribly disorganised. Still not sure how most of the game will work so will be playing around and testing things out as the week goes on. 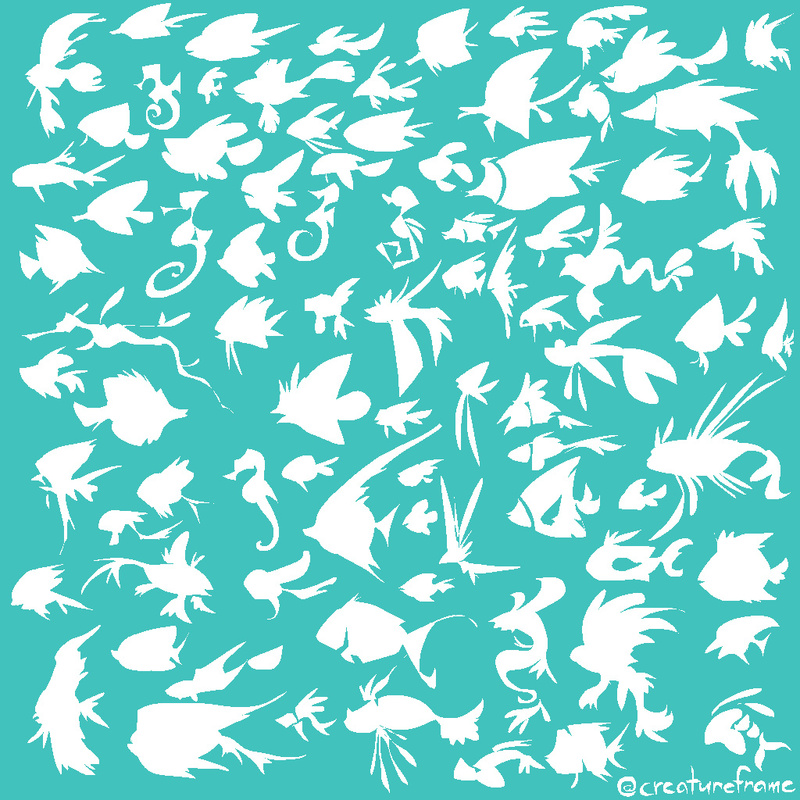 For the fish I've started banging out a bunch of real quick silhouette sketches, listing visually what different body types might be fun to model. Getting this done first up will hopefully be helpful to the sort of game I'm making, since the player needs to easily differentiate between ones they've caught already and ones they haven't and they will be quite small on screen. Also am wondering at this point how much to make the fish recogniseable as real life species or whether to lean towards more fantasy. 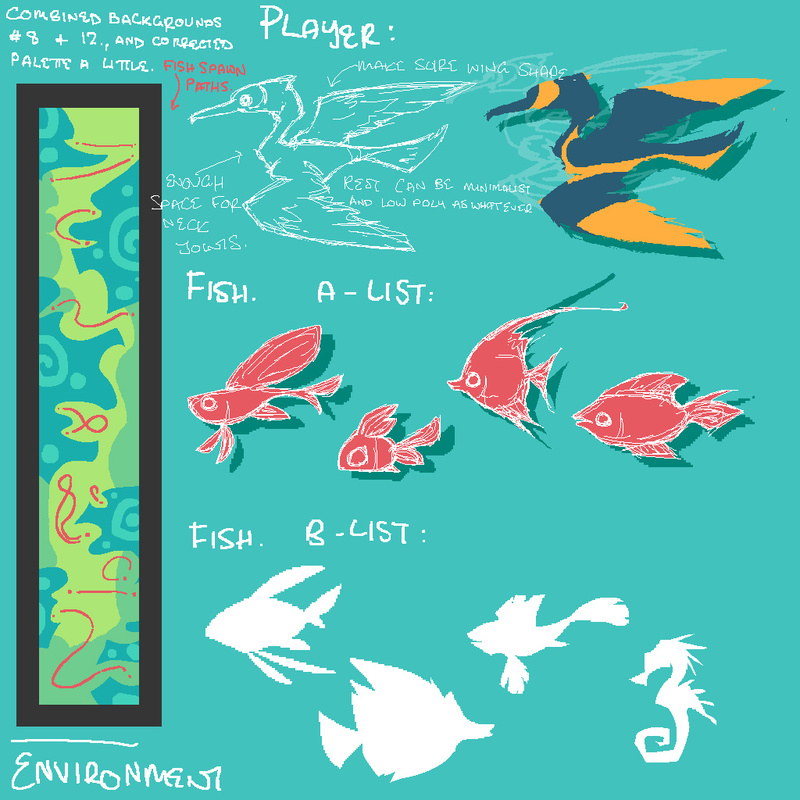 Am going to move onto concepting the background enviro now, but in the meantime will have to decide which fish would be the best to take and develop further (will hopefully have time for at least 4 of them over the jam, might decide on a priority list and a "if there's time" list), so any feedback and suggestions are very much appreciated!